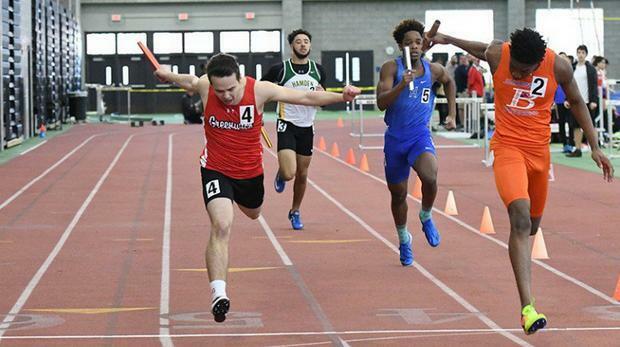 Bloomfield came in as the top ranked 4x200m squad, and the Warhawks had enough to hold off top-seeded LL winner Greenwich by .06 in another fantastic finish on the day. Hall was 3rd in 1:33.21, followed by Shelton, Glastonbury, and Hamden. Hillhouse had the top time in preliminaries, and the Academics aced their tough finals test by finishing .27 seconds ahead of Hall's 3:27.74. Ellington and Glastonbury were the top two teams in the lower-seeded 2nd section, and they placed 3rd and 5th around 4th place Weston. Danbury picked up the final scoring 6th place. The battle between top-seeded Suffield and top-ranked Xavier was a good one for a while, but then the Wildcats opened it up to smash the old meet record by more than 3 seconds while getting down to 7:59.84. The X-men placed 2nd in 8:07.60, and the final four spots were taken by Glastonbury, Tolland, Staples, and Wilbur Cross. Class LL runner-up Hall was ready to crush at the CIAC as the Warriors battered the old meet with a 3:34.06 time that was more than 3 seconds better than the old standard. Stonington was not too far off the old record in 2nd place with a 3:38.63, and Northwest Catholic, Hillhouse, Xavier, and Branford took the final scoring spots.